My latest beauty obsessions. They leave you smelling so good, like perpetual vacation. Two of my biggest pet peeves are soaps that feel slick and take forever to wash off and greasy lotions. My gut is telling me the creator of these is samesies. What a simple way to infuse some much-needed pampering into my morning routine. Also, shout out to fellow bar soap users! That's some mighty fine packaging. Do they have a strong coconut smell? You've piqued my interest, and now I want to find a place that'll ship them to Australia. P.S. I thought more people used bar soap, and now it's odd to think they don't. 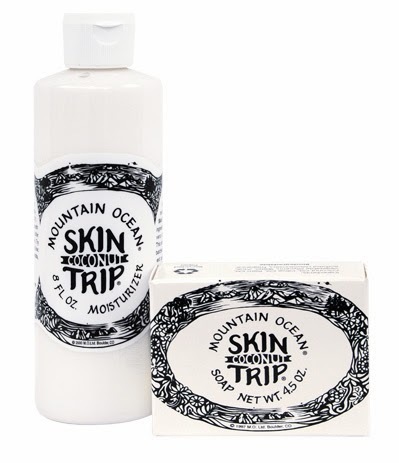 Goe Oil in the morning, Skin Trip at night = vacation all the time. OOOH YES! I asked a girl awhile ago what she was wearing because she had that perfect tropical coconut scent and I had since forgotten the brand. Thanks for posting!